Describes the components and features that AWS Elemental MediaLive provides and how to use them. A discussion forum for AWS Elemental MediaLive. Post your questions and feedback to this forum. Describes all the AWS Elemental MediaLive API operations. Also provides sample requests, responses, and errors for the supported web services protocols. Learn how video content is streamed over the internet. This course explains over-the-top (OTT) video workflows and describes how adaptive bitrate (ABR) streaming and just-in-time packaging meet the challenges of multiscreen content delivery. It also discusses content delivery networks, digital rights management, and ad insertion and replacement. 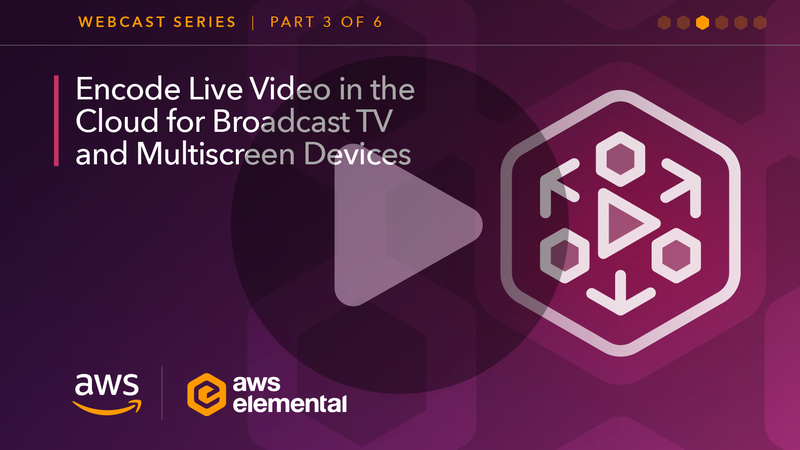 Learn about AWS Elemental MediaLive, a video processing service that enables anyone to encode high-quality live video streams for broadcast television and multiscreen devices. This course provides an overview of the features and benefits of the service, discusses common use cases, demonstrates the service in action, and looks at pricing.